Are you a Cajun or a Swede? Maybe somewhere in between? No matter which, before cooking your catch of crayfish (or crawfish, speaking Cajun) you have to decide if you want to make them spicy or not. If you go for the Cajun spicy crayfish, Trapper Arne offers you two sizes of the famous ZATARAIN'S CRAB BOIL. 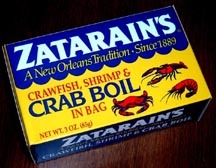 Small Package of ZATARAIN'S CRAB BOIL, 3 OZ. This 3 oz. package in a bag contains all the spices a Cajun or Creole crawfish enthusiast can desire: Mustard seed, coriander seed, cayenne pepper, bay leaves, dill seed and allspice. Sufficient for a 4 lbs crayfish boil. See ZATARAIN'S crawfish recipe below. 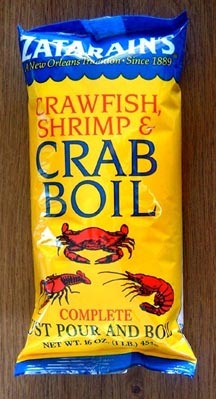 Large Package of ZATARAIN'S CRAB BOIL, 16 oz. For a larger crawfish boil, or several small ones, the 16 oz. ZATARAIN'S CRAB BOIL will give you foolproof cooking results every time. Just pour into boiling water, add the crayfish, and maybe some potatoes and corn, and you're heading for a superb crayfish dinner. See ZATARAIN'S crawfish recipe below. "It is very important that every crayfish be alive before boiling. Wash thoroughly in cold water. Boil water, salt and dill 2-3 minutes, remove dill, then plunge crayfish into water. Cover and after boiling resumes,cook 6-7 minutes. Add more dill, cool in 'pot liquor' and keep in refrigerator before serving. Arrange on platter. Garnish with heads of dill." That's it! How simple can it get? Note the amount of water in relation to the salt. This relationship is the most important part of a crayfish recipe. This is what makes the crayfish taste so good. 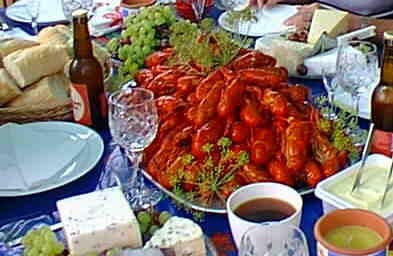 Notice also that Swedish and Finnish recipes assume you eat the crayfish cold. But that's up to you. Most Americans eat them warm. However, I have found that crayfish always taste better if they have steeped in the brine for a few days. And that implies that they will be served cold. "Bring water mix to a boil. Add seafood and bring to a boil. Boil crawfish vigorously for 15 minutes. Allow crayfish to remain in water five minutes after boiling." Here is another Cajun recipe that is also popular. "Use a clean 20 quart pot. Fill pot to 3/4 full with water. Add onions, potatoes, celery, corn, salt, black pepper, Cheyenne pepper and bay leaves. Bring pot to a full rolling boil. While pot is coming to a boil, repeatedly soak crawfish alternately with salted water and plain water for about five minutes each until water is clean when drained. When the pot reaches a full rolling boil, add crawfish and cover until the pot returns to a full rolling boil. Continue cooking for 5 to 7 minutes. Drain pot and pour cooked crayfish onto a very large platter. Jump in and start eating. 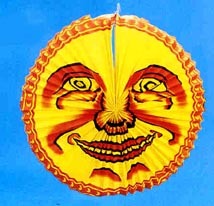 Serve with melted butter for the corn and potatoes. Add Tabasco sauce according to taste. Drink your favorite ice cold beverage with this feast!" 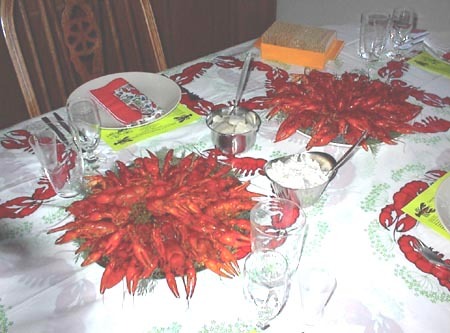 If you want to expand your supply of crayfish recipes, just look in your cookbooks under lobster or crab recipes. Then substitute crayfish instead, and you'll have plenty of new recipes. Here is the last of the recipes. The fact that it is rather simple makes me look kindly at it. "Procedure: Wash crawfish and purge in salt water. In a 10 gallon pot bring about 4 gallons of water to boil with seasonings. Add crawfish and potatoes and corn and bring to a boil quickly. Cook for approximately 12-15 minutes. Turn off heat and let soak for 5 minutes. Remove from water and serve. Servings: 4"
As I haven't personally tasted all of the above recipes (except the Swedish one) I am not the person to rate them. But as I am a person of simplicity, I certainly favor the Swedish/Finnish recipe. The Cajon recipes are just a little too complicated for my nature. Also, they don't seem to care about the relationship between salt and water; a factor that I think is highly important if you want your crayfish to taste good. In other words, I recommend the Swedish recipe!